Get ready to easily cut clean, perfect circles out of cloth, paper and more in just one step with this innovative cutter. The handle design creates a "stirring the soup" cutting motion to effortlessly cut perfect circles from 1-1/2" to 8-3/4". Good For: making circles in fabric for quilt making, applique, scrapbooking, etc. Great for curved quilt patterns as well. Designed for comfort and ease of use, the patented ratchet handle aligns the hand and wrist to help reduce wrist fatigue associated with cutting in a circular motion. Includes a built-in blade cover for safety, and a plastic guard to cover the pivot spike when not in use. 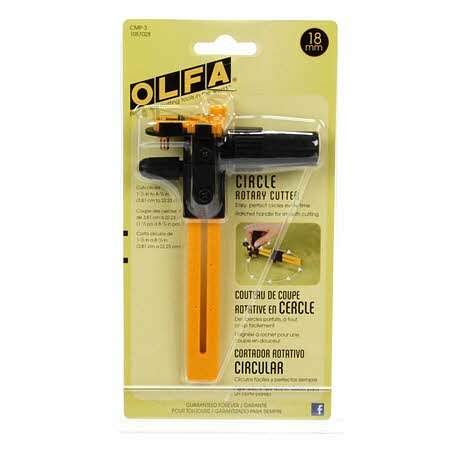 Uses OLFA 18mm replacement blades. Designed for both right- and left-handed use.